Tiny prices - bargains for you! Do you like a bargain? I guess most of us do, especially when we find something that we need or that really appeals to us. 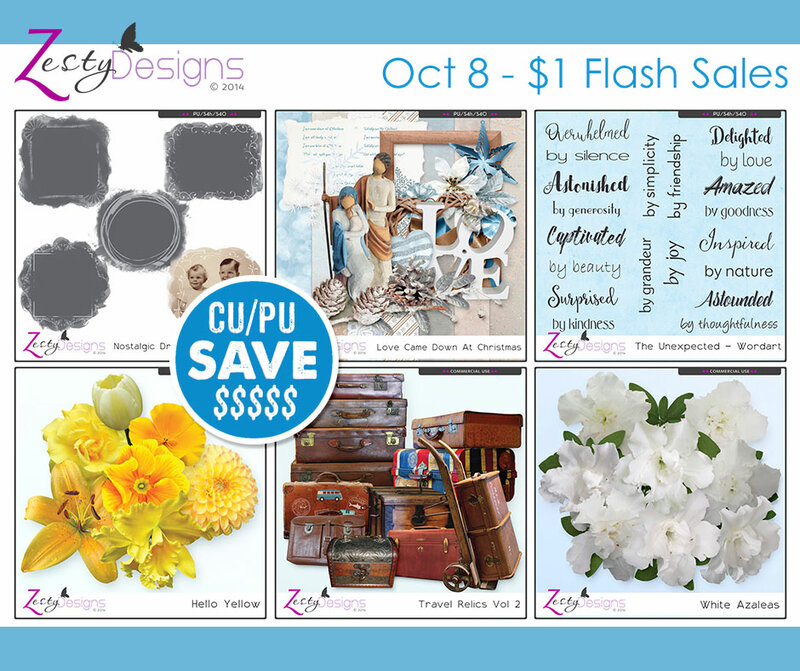 Well, I have news for you...right now, at the Studio we have our $2.00 Kit Sale. Yes, that's right, several kits have been set on sale which means "Big Savings". Don't miss these! Did you pick up your $1.00 packs (or $8 bundle) in the Co-ordinated Collection? There's only a few days left on these. You'll find my collection, "Mountain Air" in store HERE. Last, but not least, if you think a FREEBIE would be great, as well as all these super savings, spend $8 on personal use products and you can add the Free With Purchase to your cart. My "Tea or Coffee" is FWP for a few more days only. It's that time again...Co-ordinated Collection time at theStudio! 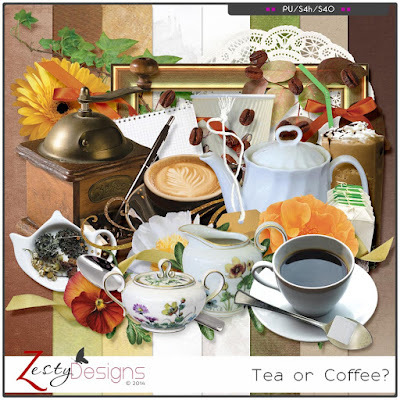 Each quarter the designers get together around a common palette to create beautiful collections that will allow you to pick and choose to create your own wonderful matching collection. 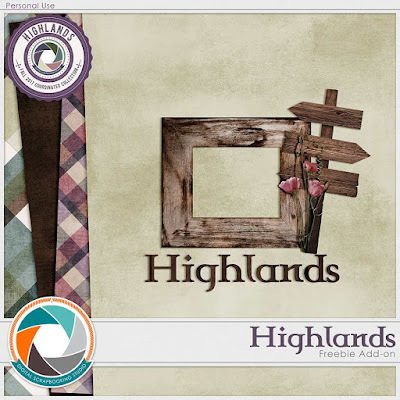 The theme this time is "Highlands" with the Scottish Highlands being the underlying inspiration. 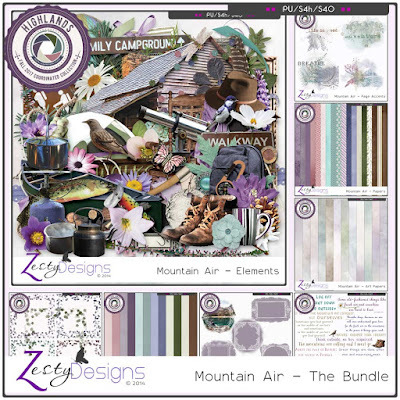 Not everyone has been to Scotland or wants to go to Scotland, so I took a slightly different path and while using the same palette, chose "Mountain Air" as my theme. As I was designing this bundle, the lines of the Kite song from Mary Poppins kept running through my head: 'Up through the atmosphere, Up where the air is clear'. My thoughts were filled with pictures of high mountains where the air is pure and clean. I could almost smell the pine forests on the mountain slopes. I could 'see' the clear mountain streams and waterfalls and the crystal clear lakes. I pictured sitting in a rocking chair on the verandah of a log cabin, taking walks through forests and listening to the music of water tumbling over rocks as it made it way down to a valley far below. I could see a camp site on the edge of a lake with families gathered around a camp fire cooking dinner and chattering about their adventure-filled days. I just wanted to breathe in that mountain air and let it fill my lungs and refresh my body and soul. 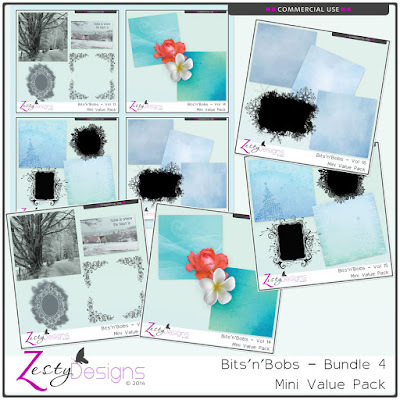 The Element pack contains 76 elements, there are 18 mixed Papers, 12 Art Papers, 12 Textured Solids, Photomasks, Page Accents, Transparent Border Overlays and Wordart. Co-ordinating FREEBIE Add-on that matches with the Co-ordinated Collection at TheStudio! Don't forget to pick yours up at TheStudio today!! It's that time of year again...DSD (Digital Scrapbooking Day) and there is a lot going on around digi-world this weekend. Be quick - time is nearly up for these... ruuuunnnnn!! 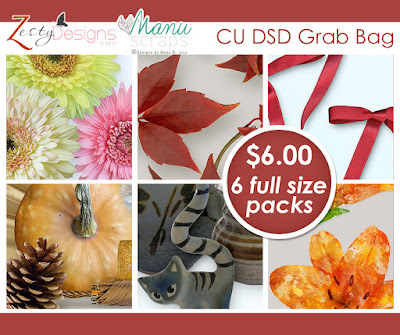 Don't miss out on these great bargain buys. available for long, so get in quick. These can also be used for Personal Use. Take a look at full reveal in store HERE. 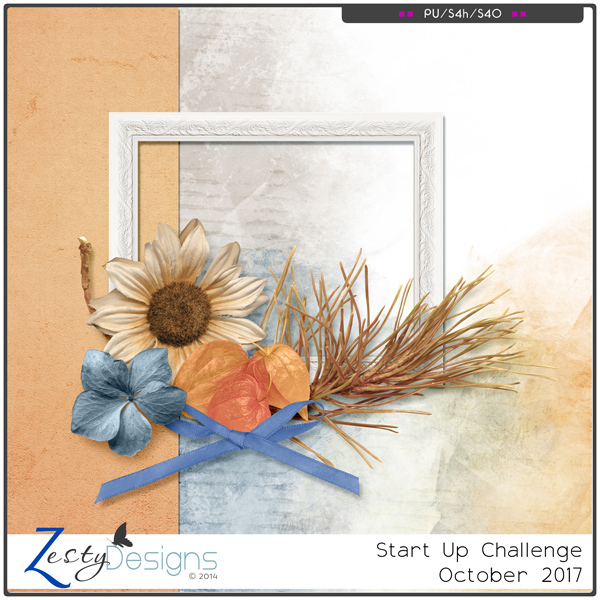 The October Start-Up Challenge is waiting for you in the Forum HERE. Download your FREE Start-Up Mini Kit, add a few extra pieces from your stash, to create a beautiful page. 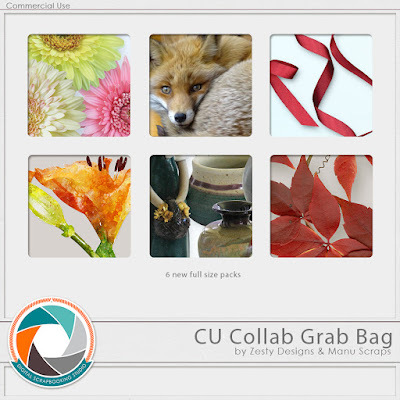 Next Designer Contest and Layout Artist Competition - these kick off on October 7. Sign up now HERE.